Forget about how important the issues are. Forget about actually caring about the people of Florida. Charlie Crist won’t go where there aren’t lights, cameras, and action! I need some basic info, which I will then forward. How many people will be there? Is it televised? What dates and times are you talking about? How long will he need to be there? These are basic questions that I need an answer to. I can tell you that it’s far more likely that he’ll go someplace where he spends ½ hour talking to 500 people, than it is for him to go spend 3 hours talking to 25 people. Please get me the info asap. Now, I realize that Candidates can be very busy, but when the first questions asked include “Will it be televised?”, there is a problem. 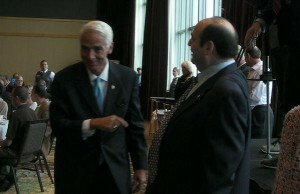 Does Charlie Crist only perform for the cameras? That’s what ACTORS do. Is this new-found Democrat just acting? Does he only care when there are news cameras flashing? It sounds like it to me. Representing the people of Florida is not something that is done solely for the “publicity” it might bring. Well, it isn’t unless your name is Charlie Crist. Women make up the majority of the voters in this country. We vote. We pay attention to the candidates. Most importantly, WE WANT TO BE HEARD! By the way, I wonder if Nan Rich has received her “Voicemail” a la Kendrick Meek, from Charlie Crist yet. Remember this? Women need to know where Charlie Crist stands on the issues that are important to us. This game of hide-and-seek he seems to be playing with Women’s issues, and discussing them, isn’t going over well at all. He has already refused to debate Senator Nan Rich, and I’m sure it is because he can’t stand up to a TRUE democrat who genuinely cares about women’s issues. His record against hers pales, and he can’t risk a side-by-side comparison. Charlie Crist is counting on the women of Florida wanting Rick Scott out so badly, that they will vote for him. I know The Powers That Be in the Democrat party have come to that resolution, but remember Charlie, when each INDIVIDUAL goes into that voting booth, we WILL remember exactly who and what you are. Well, maybe not, you do change positions like you change underwear. Where is the other “Democrat”? Are you referring to Charlie “I was a Republican, then an Independent, then a Democrat, just so I could win” Crist? What makes you think he won’t change party affiliations if the price is right while in office? He’s done it before, he can do it again. Thanks Leslie. My sentiment exactly. I disagree with that comment. Any Democrat that will not debate another Dem is arrogant & does NOT respect their potential constituents.